Transcripted Review: Buy, Wait, or Skip? 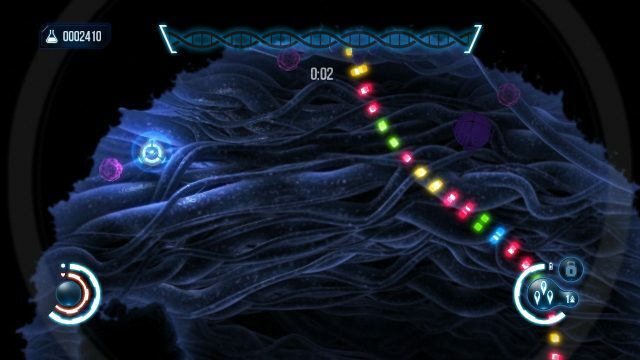 Transcripted is a unique mash-up between twin-stick shooting and Zuma-like puzzle chaining that sounds a bit weird on paper, but feels very fluid in concept. 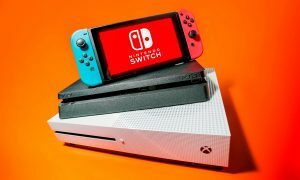 Developer Alkemi did an excellent job combining these two genres to create seamless gameplay that feels fun and simultaneously challenging without being too frustrating thanks to adjustable difficulty. Let me be the first to admit that I don’t really care for most twin-stick shooters. I never fell in love with the genre as a child and each subsequent game I’ve tried has left me feeling frustrated rather than fulfilled. I was afraid I’d feel the same way as I ventured into Transcripted, but I’m happy to say that Alkemi has considered that not everyone is amazing at twin-stick shooting. 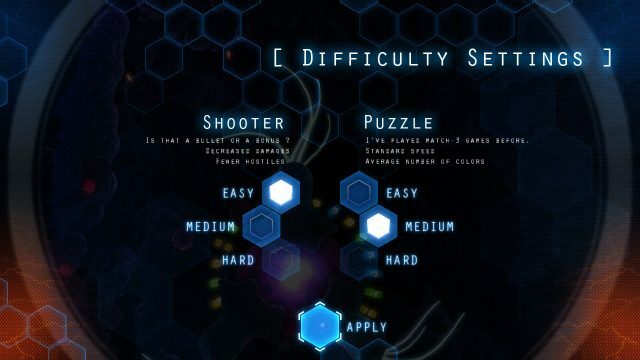 They’ve included a variable difficulty setting so you can fine tune the difficulty for the twin-stick shooting and puzzling separately. If you’re like me and you’re a puzzling fiend, up the difficulty on the puzzling aspect but lower the difficulty for the twin-stick shooting. I have to applaud them for this approach because it makes the mash-up between the two genres less frustrating depending on your skill level. 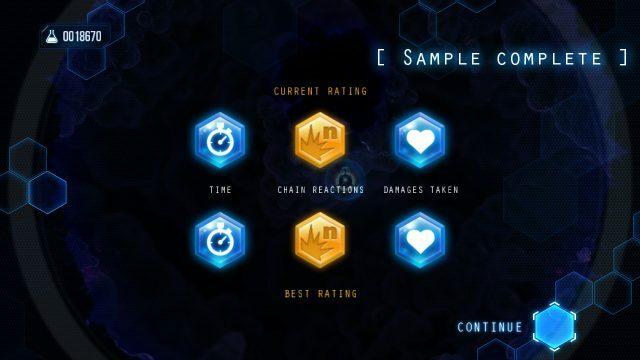 There are 25 fully voiced campaigns that you can complete to tell the whole story, which seems to revolve around you being a surgeon’s assistant using microscopic tools to address issues with the DNA of tissue samples. It’s a clever story construction that feels believable, since the Zuma-like chains really resemble DNA. I don’t want to spoil the story for you but I found myself progressing just to hear what happens next. The boss battles were a pleasant surprise and perhaps the most interesting aspect of the game for me, since each requires a different strategy in order to defeat. 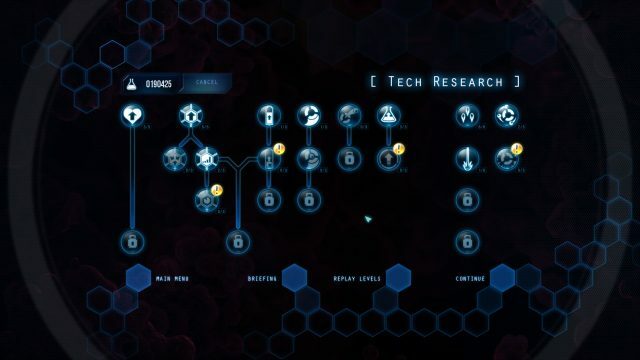 As you progress through the campaigns, you’ll earn points you can spend on the tech tree to upgrade your reticle with better weapons, faster speed, and more shields and health. In that way, you feel like you’re progressing even when you go back and re-try campaign levels. Throughout the various levels of the campaign your objective changes enough to merit different play styles, too. During the first half of the game you’ll be making match-three combos as quickly as you can in order to fill the DNA bar, but toward the later levels you’ll be tasked with separating colors to prevent match-threes, turning the gameplay aspect on its head. 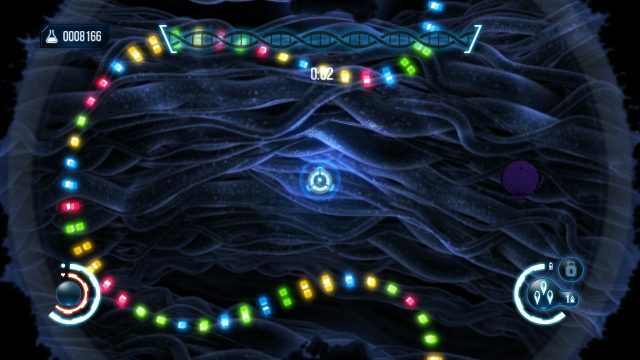 There are also some levels where you can control the speed of the DNA chain in order to make things interesting. Usually when a game combines two genres it does neither genre very well, but I was very pleased with how Transcripted played once I set up the difficulty for my skill level and sat back to have fun. My only real complaint about the game is that the font used in the menus is very small when playing in portable mode and it’s not the easiest to read. Transcripted is a single-player experience only, so there’s no co-op available. Oh my. Music is a huge factor for me whether I enjoy a game or not, especially since you spend hours upon hours with it as the background for your gameplay. The Transcripted soundtrack is pretty stunning, so I was shocked to find the developer mentioned in a thread on Steam that the soundtrack is made up entirely of stock music they licensed for the game instead of a dedicated soundtrack. It fits the mood of the game perfectly and I’m a bit bummed composer Ian Blumfield doesn’t offer a Bandcamp download for the music since it’s so well done. The first track that appears in the video below is my favorite song and one that I continually find myself humming even while I’m not playing the game. Seriously, check it out. It’s good. Yes. I went into Transcripted assuming I would hate it because I’m not very good at twin-stick shooters, but the ability to change difficulty for the puzzle and shooting aspects really makes that a non-issue. The story the game tells is interesting enough and the way the mash-up between shooting and Zuma-like puzzling works makes you want to go back and replay levels to get higher scores. The soundtrack is truly excellent and the $7.99 price tag makes this a no brainer if you enjoy puzzle games in any capacity. Even if you’re not too keen on twin-stick shooting, pick this one up. It’s worth it. Neverstill Media has affiliate partnerships. 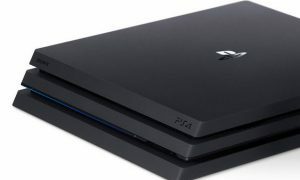 These do not influence editorial content, though Neverstill Media may earn commissions for products purchased via affiliate links.